MCRs represent an important trend in organic synthesis. These reactions, that assemble more than two components within a same molecular framework, have attracted considerable interest in relation with the structural complexity reached in a reduced number of synthetic steps. Indeed organic chemists, in response to growing environmental concerns, are more and more adapting their synthetic strategies in order to comply with the concepts of step and atom economy. In this context, multicomponent reactions are important tools. When MCRs involving more than three components are considered, isocyanide chemistry is often introduced due to the high efficiency and versatility of the Ugi 4-component reaction. This reaction discovered in 1959 has been extensively used in the last twenty years. Most 4-component synthetic strategies display a Ugi coupling followed by a so-called "post-condensation" step in order to form highly diverse scaffolds in less than three steps. Research on isocyanide based MCR at ENSTA has focused on original Ugi post-condensations involving complex cascades, new organometallic catalyzed process as well as radical couplings. On other important strategy in our group is to think about original ways of introducing isocyanides in multicomponent couplings. 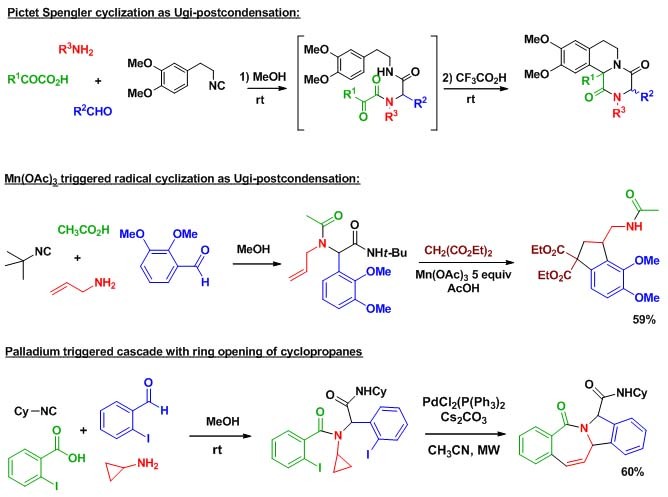 Among various projects involving Nef isocyanide reaction, [4+1] cyclizations, and variations on the Ugi coupling, our Ugi-Smiles extension certainly represent the project with the highest synthetic potential. 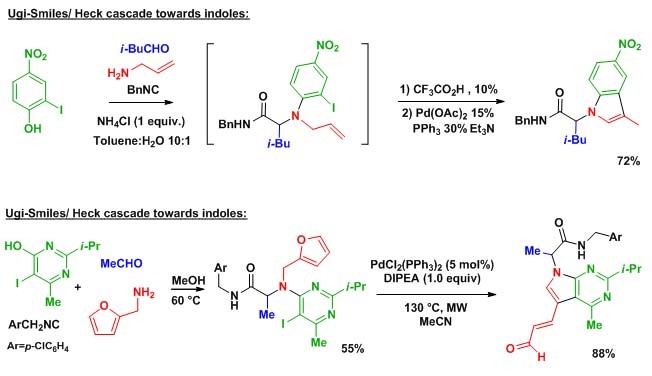 Taking phenols and hydroxy-heterocycles as acidic partners in Ugi reaction, we were able to disclose a new N-arylative coupling involving as Smiles rearrangement as the key step.This new family of Ugi couplings opens the way to many post-condensation studies involving new cyclocondensations as well as organometallic couplings.